The beauty of Spring is blossoming just about everywhere, with front yards presenting blooming colors and back yards scattered with new perennial growth. By adding a little imagination, creativity and love, the type of gift ideas that would spruce up any patio, deck or outdoor area seem endless. And, here are some unique gift ideas to help you visualize what’s available at ChristmasGifts.com for anyone’s outdoor garden. There’s nothing as dramatic as bright colors intermixed among a garden area. That is the reason that flowers bring a smile to just about anyone’s face. 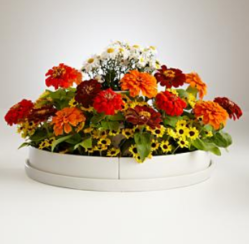 This three-tiered ceramic flower planter from Red Envelope comes with flower seeds that will provide a splash of color in any spot on a patio or deck. As flowers burst to life, the visual charm explodes all around it. 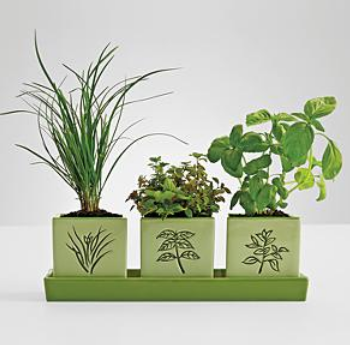 This same planter above is also available with herb seeds. The flavorful mix of popular cooking herbs includes sweet basil, Italian parsley, oregano, chives. An outdoor fire pit is one of those presentations that provides soothing, restful moments outdoors. 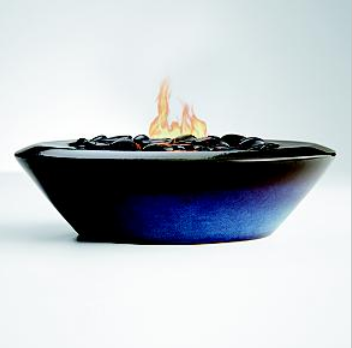 The ceramic fire bowl pictured above is one of those fire pots that can be placed outside or in the house on a coffee table to replace candles for ambient light. Apparently, the gift of tiny animal-shaped bells has been a tradition in northern Japan for generations. 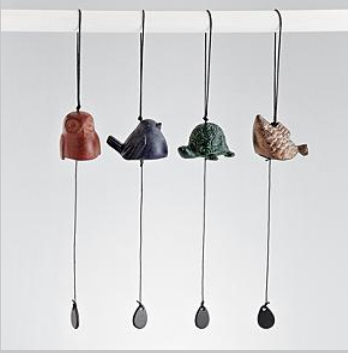 These Japanese Bird Bells is one of those gifts that would please anyone, as they bring cheerful sounds and create warmth and inspiration. Again, color is the glory here. Artisans in Mexico transform recycled glass into a hummingbird feeder that gets its character from an etched design of vines and hummingbirds. 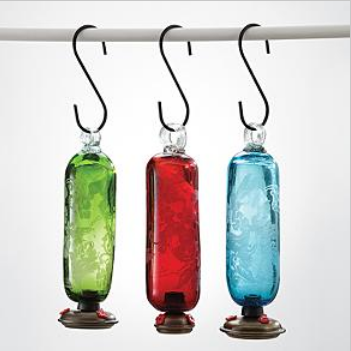 With these colorful Filigree Glass Hummingbird Feeders, a garden will have charming feeders that will satisfy the flock’s sense of style as well as its sweet tooth. Bring the outdoors inside with a modern vertical garden. 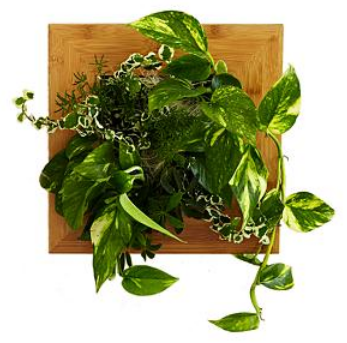 This square bamboo wall garden is an assortment of four beautiful foliage plants. The frame includes hardware for easy attachment to any wall, or it can be placed on a table. The plants are rooted in pouches housed within the frame and require only minimal watering to thrive. A person can grow a windowsill garden year round, and this one is made with candy-colored earthenware to make them stand out. Each pot features an illustration of the corresponding flower – seeds of petunias, marigolds, pansies, lobelia, alyssum, zinnias, impatiens, baby’s breath, dianthus, cosmos, poppies and sweet peas. 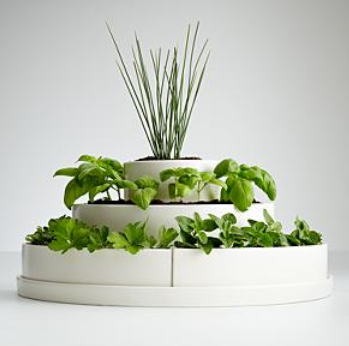 The secret to great Italian cooking is using the freshest ingredients, which makes this Italian herb garden a great gift. The glazed ceramic containers are embossed herb illustrations, and the seeds included in this kit are basil, oregano and chives. These are just some of the unique gardening gifts available from sponsors at ChristmasGifts.com that we’ve selected to give you some gift ideas. 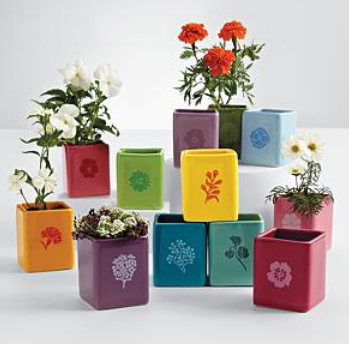 What type of gardening gift have you given in the past? Wow! look at all these new ways to display flowers and plants! There are so many different set ups for every kind of home and garden!